And if current activity is any indication, 2016 will be an even bigger year than last. 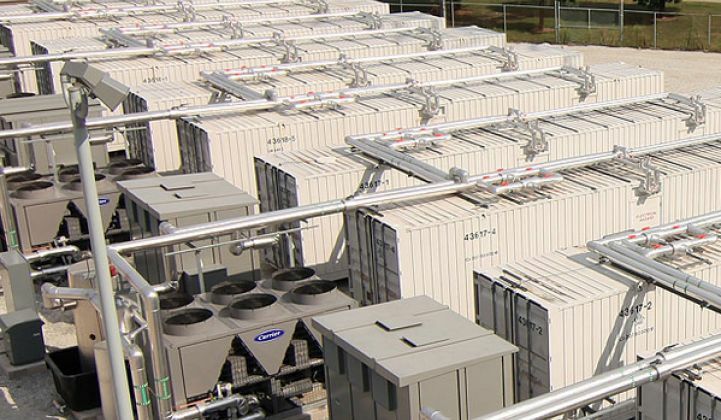 Last year will likely be remembered as the year that energy storage got serious. While projects of all sizes were installed in record numbers, distributed storage received outsized attention -- particularly in the U.S. But what of the larger grid-scale projects? We thought it would be helpful to round up some of the biggest energy storage projects that went live last year around the world. Starting off our round-the-world tour in Europe, two big battery projects were tied for the top spot in 2015. In September, developer Energiequelle opened a 10-megawatt utility-scale energy storage plant at Feldheim in Brandenburg state, Germany. The lithium-ion installation at the Regional Regulating Power Station has been designed to provide frequency regulation services and help integrate more wind power into the grid. However, as the year came to a close, the German project had to share the top spot with a Dutch rival. Going live just before Christmas, AES’ first installation in Europe -- in Vlissingen for state-owned system operator TenneT -- provides primary control reserve, frequency regulation and load balancing to the grid, using lithium-ion chemistry and AES’ Advancion technology. AES is planning another 10-megawatt project going live in Kilroot, Northern Ireland in January this year. In the Americas, SolarReserve’s 110-megawatt Crescent Dunes solar tower in Tonopah, Nevada finally became operational in September and is now providing up to 10 hours of molten salt storage for cloudy days and night time. On the battery storage front, the biggest project installed last year in the Americas consisted of two 31.5-megawatt installations from Invenergy. Its Grand Ridge energy storage project was deployed at a wind farm about 80 miles southwest of Chicago. As well as helping to integrate the energy from those turbines into the grid (and some solar power), it was designed to offer fast-response frequency regulation. The Grand Ridge project features an array of lithium-iron-phosphate batteries manufactured by China’s BYD. The second, very similar, installation was at Beech Ridge in Rupert, West Virginia, about 60 miles southeast of Charleston. Both battery projects serve the PJM Interconnection. Africa also made strong advances in the concentrating solar power field last year, with two large projects built at either end of the continent. KaXu Solar One went live in South Africa. The 100-megawatt CSP plant has 2.5 hours of thermal storage capacity, and it is expected to power 80,000 local homes. The troubled Spanish company Abengoa is behind the project and has been working with local companies for the engineering and construction. Meanwhile, thousands of miles north, ACWA Power raised funds from a variety of international institutions, plus the king of Morocco, to build the 160-megawatt Noor-I CSP plant in that country. The Saudi company and its partners had hoped that the project -- which stores energy for up to 3 hours -- would come on-line last year. However, the opening was postponed at the last minute. Company spokesperson Jon Barber said the delay was “purely” due to scheduling problems caused by the “many very senior people” who wanted to attend the launch. As of the time of writing, efforts to confirm a new date with ACWA have been unsuccessful. Another would-be contender for the largest energy storage project in Africa -- and indeed the world -- was the planned 1,332-megawatt Ingula pumped hydro plant between the provinces of Free State and KwaZulu-Natal, in South Africa. Although scheduled for last year, utility Eskom’s third such project has been delayed, at least partly due to labor unrest, and will probably not be active until the middle of 2016. The Asia-Pacific region has been gearing up its production of batteries for a while now, with Japan and South Korea as clear leaders in manufacturing. Unsurprisingly, both of these countries can boast impressive new electrochemical storage projects that were constructed in 2015. Tohoku Electric Power Company's Nishi-Sendai Substation, in Japan, started operation of a Toshiba-supplied 40-megawatt lithium-ion battery system in February for frequency regulation services. Also in Japan, Hokkaido Electric Power Co.’s 15-megawatt/60-megawatt-hour vanadium redox flow battery from Sumitomo started operation last December. Located next to one of the country’s largest solar power plants, it will be used for frequency regulation as well. Korea’s largest battery installation was Korea Electric Power Corp.'s 28-megawatt lithium-ion array, which has also been earmarked for frequency regulation and will serve the grid around Seoul. The country says it is planning up to 2 gigawatts of storage by 2020. “Stationary energy storage continues to show strong growth in the number of projects delivered, the total amount of energy storage deployed, and the size of utility-scale storage systems. These trends are likely to continue as storage increasingly becomes a grid management asset, and we will consistently see records broken for the capacity of the largest stationary energy storage plants," said Dean Frankel, an analyst from Lux’s energy storage team. For more on how the landscape for large-scale storage is evolving in the U.S., read GTM Research's Energy Storage Monitor.